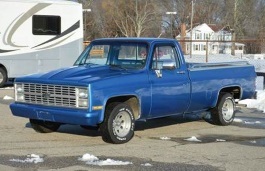 Correct Wheel Sizes, PCD, Offset, Rims and Tire specs for Chevrolet C10 series. How wide of a tire will fit on a 15x8 wheel and still fit in the stock rear fleetside wheel we'll ? What backspacing ? Hi,Steve Schieberl,The wide from 225-235.It can fit for the fleetside. Is there any way a stock alloy wheel (18") from a 2013 Chevy Malibu LTZ could fit on a 1964 C10 pickup (6 cyl)? Hi,Scott McClain,Can you show me the wheel size for your 1964 C10? Will bolt pattern 5x114.3 fit a 81 chevy c10? Hi,Jay Bosquez,The bolt pattern is 5*127.